“Now, I don’t know if a lot of you have heard this but the CIA annex had actually taken a couple of Libyan militia members prisoner, and they think that the attack on the consulate was an effort to try get these prisoners back, so that’s still being vetted,” Broadwell said during the question-and-answer session of her presentation when an audience member asked her to comment on Libya. “So he’s known all of this ~ they had correspondence with the CIA station chief in Libya, within 24 hours they kind of knew what was happening,” Broadwell said. The Obama administration tried to claim an anti-Muhammed video caused the terrorist attacks and has repeatedly punted on whether they they turned down additional security measures and reinforcements that were requested. Broadwell, though, said there was a system failure that led to four Americans being murdered in part because additional security forces were denied. Broadwell said “the challenge has been the fog of war, and the greater challenge is that it’s political hunting season, and so this whole thing has been” politicized. Petreaus was slated to testify before Congress this week about Libya before his prompt resignation. Republicans in Congress said Petreaus’s resignation does not preclude him from testifying in the future. On Sunday, it was revealed Broadwell allegedly sent threatening emails to a Florida woman, whom she may have suspected was having an affair with Petreaus. Jill Kelley ~ the woman who received the threatening emails ~ reported them to the FBI. The FBI conducted an investigation and discovered Petraeus and Broadwell were having an affair. Here is the live presentation at her Alma Mater connected to her book release. I believe the stand down order came from Obama to let the 4 Americans die without reinforcement from the Seals because he didn't want the clandestine CIA torture facilities and transport of mercenaries to Syria to be exposed. Petraeus laid the blame where it belonged (on Obama) and he was forced to resign. 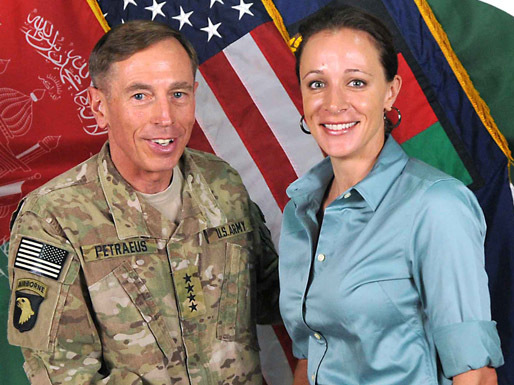 The honeytrap is maybe true but is a demonization of Petraeus in preparation for him to be the fall guy. The Seal's commanders report is consistent with the CIA being told by Obama to let the 4 American's become collateral dammage.